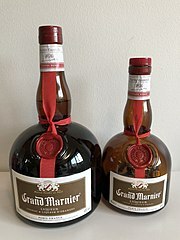 Grand Marnier (French pronunciation: ​[ɡʁɑ̃ maʁnje]) is a French brand of liqueurs. The brand's best-known product is Grand Marnier Cordon Rouge, an orange-flavored liqueur created in 1880 by Alexandre Marnier-Lapostolle. It is made from a blend of Cognac brandy, distilled essence of bitter orange, and sugar. Grand Marnier Cordon Rouge is 40% alcohol (70 proof in UK, 80 proof in US). Aside from Cordon Rouge, the Grand Marnier line includes other liqueurs, most of which can be consumed "neat" as a cordial or a digestif, and can be used in mixed drinks and desserts. In France, this kind of use is the most popular, especially with crêpes Suzette and crêpes au Grand Marnier. César Ritz (1850–1918) reportedly came up with the name "Grand Marnier" for Marnier-Lapostolle, who in return helped him purchase and establish the Hotel Ritz Paris. On March 15, 2016, the Campari Group announced a friendly takeover offer for Société des Produits Marnier Lapostolle S.A., the owner of Grand Marnier. Cordon Rouge ("Red Ribbon") is an orange-flavored cognac liqueur and the original Grand Marnier liqueur, which was created in 1880 by Alexandre Marnier-Lapostolle. It is consumed neat and is also used in mixed drinks and desserts. No. 1 - Natural Cherry - A blend of Grand Marnier Cordon Rouge with wild tropical Haitian and Dominican oranges and European Griotte cherries. No. 2 - Raspberry Peach - A blend of European raspberries and rare red peaches from Ardèche, in the South of France, combined with Grand Marnier Cordon Rouge. Cordon Jaune ("Yellow Ribbon") was only sold in some European countries and at some major international airports. The production stopped on January 1, 2017. Cordon Jaune is a triple-sec Curaçao-like liqueur that is made with neutral grain spirit instead of Cognac. It does not resemble Cordon Rouge or other orange-flavored brandy liqueurs so much as other high-quality, 80 proof triple-sec Curaçao liqueurs, like Cointreau original or Gabriel Boudier Curaçao Triple-sec. Cuvée du Centenaire ("Centennial Edition") was first released in limited quantities in 1927 to commemorate the 100th anniversary. It is made with up to 25-year-old fine cognacs and is consumed neat. It is more expensive, at about US$145 per bottle. The Cuvée Spéciale Cent Cinquantenaire ("Special Sesquicentennial Edition") was created in 1977 to honor the 150th anniversary of the brand, and is currently the most expensive variety of Grand Marnier. It is made with up to 50-year-old cognacs in frosted glass bottles featuring hand-painted Art Nouveau decorations. In 2005 it was marketed with the slogan "Hard to find, impossible to pronounce, and prohibitively expensive." Cuvée Louis-Alexandre Marnier-Lapostolle is a special selection of cognacs taken from the best known districts (Grande Champagne, Petite Champagne, Borderies, Fins Bois and Bons Bois) and aged at length in oak casks. It is only available in duty-free shops in Canada and France and liquor stores in Quebec, Canada, and the Netherlands. Grand Marnier is used in several kinds of pastries, such as liquor cream buns. It can also be used in the French Christmas dessert known as Bûche de Noël (Yule log). It is frequently used in recipes for cranberry sauce, as sweetness and citrus can be a contrast to the bitterness of cranberries. It is also an ingredient for the preparation of flambé dishes, such as crêpes Suzette, Grand Marnier soufflé and crème brûlée. It can also be used in the sauce of the "Canard à l'orange" roasted duck dish. It can be simply drizzled over vanilla ice cream. It can also be used in some fruitcake recipes instead of brandy. Grand Marnier can be used in mixed drinks. Some examples of these include the Cosmopolitan, Margarita, Sangria, Sidecar, Dirty Harry, Grand Mimosa, B-52, the Grand Marnier Smash, The Grand Smash, The Smash Marnier, The Bloody Smash, The Maced Marnier, The Ace Marnier Smash, Frosty Smash, The Smace, The Grand Hound, The Blood Pug, The Clarke, The Nogley and the Grand Marnier Fireball. In many mixed drinks, such as the Cosmo and the Margarita, it can be used as an alternative to Cointreau or triple sec. ^ Michelli, Joseph (13 June 2008). The New Gold Standard: 5 Leadership Principles for Creating a Legendary Customer Experience Courtesy of the Ritz-Carlton Hotel Company. McGraw-Hill Professional. p. 3. ISBN 978-0-07-154833-5. Retrieved 20 May 2011. ^ "A Toast to a Liqueur (if You Can Say It)". Retrieved 10 December 2017.